Share this product and receive a $6.16 sharing discount. The awesomeness of God's creation. Psalm 36.6 "Your righteousness is like the mighty mountains." 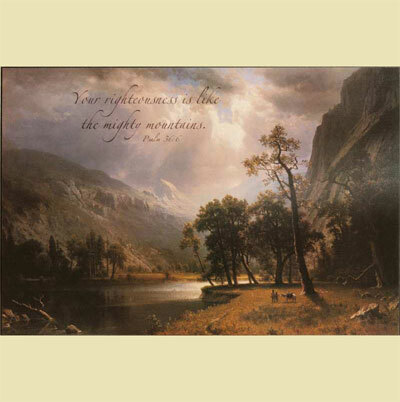 Print Artist is Albert Bierstadt. Height is 24" and width is 36". This piece is from our mounted canvas print collection. 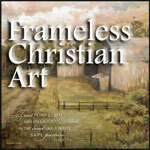 It is durable, inexpensive, and has the appearance of stretched canvas. It is made by taking the print and using a large format printer to etch the words onto the print. The print is then mounted by hand to a painted carved piece of MDF wood. Glued down and pressed flat, a textured finish is hand rolled on that protects the print and gives the appearance of stretched canvas. All of our mounted canvas prints have either a single sawtooth hanger on the back or two hangers 16 inches apart or a hanging wire. Most prints have rubber bumpers on the back to keep level against the wall.